Kanger UBOAT 3pk Cartridges The Kanger UBOAT cartridge requires the user to fill e-juice into t..
Kanger UBOAT ModThe KangerTech UBOAT is the ultimate closed system e-cig with the design of a submar..
Kanger UBOAT Starter KitThe KangerTech UBOAT is the ultimate closed system e-cig with the design of ..
Kanger VOCC-T CoilsThese VOCC-T are the updated version of the original VOCC atomizer heads. They co..
Subdrip 160Dripbox 160DIY Drip base & clapton coilReplacement Drip coil(Kanthal)Extra juice tank..
Kangertech CLOCC Coils 5 Pack.5 Ohm.15 Ohm Nickel.. Diameter : 22mmLength: 46mm（exclude drip tip and 510 thread）Weight: 66gVersion 4.0 capacity: 4mLMod ..
1. Resistance: 0.5Ohm/35-60W2. Evenly Vaporize Juice3. SSOCC compatible4. No burning taste5. Kanthal..
New Stainless Steel Organic Cotton Coil0.5 Ohm NiChrome for Variable Wattage / Range 15 - 60 W1.2 Oh..
Kangertech Clapton Coils5 PackAvailable in .5 Ohm.. 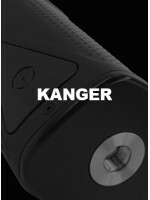 The Kanger OCC, short for Organic Cotton Coils, are replacement coils for your existing Subtank seri.. Product Features:organic cottonAvailable in 0.2Ω, 0.5Ω and 1.2Ω resistancesExclusive coil for Kanger..